July 2017 – “If you’re a fan you’ve got to have it…” a nice review, from the Woman Driver blog of all places! Liz Turner interviewed Jon Lord years ago about his car history, so Steve Clare asked her about this, and she offered to do a review! Great blog too. 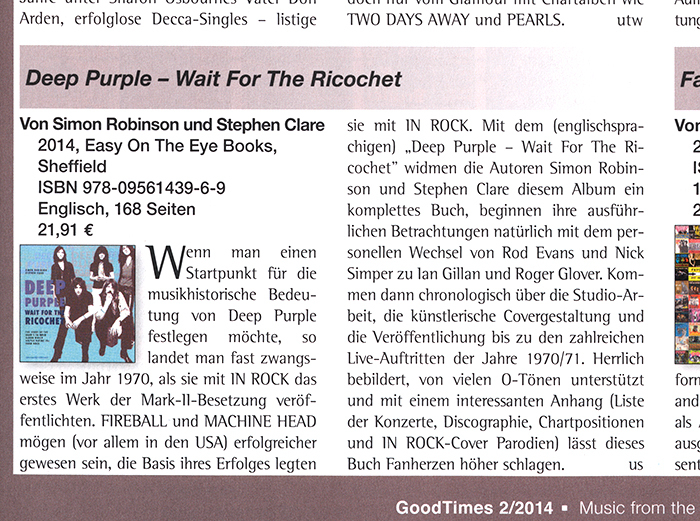 Red Hot Rocks (USA), Hush (Spain), Classix (Italy), Classic Rock Society (UK), PoeiraZine (Brazil), Slam (Austria). “One of the many joys of being a fan of Deep Purple over the years has been the steady tide of archive material which has been prised from the vaults and presented in almost uniformly stunning quality both in terms of material and packaging. Past releases have been lapped-up by eager fans primarily of course for their musical content, but also for the comprehensive sleeve notes and photo-memorabilia, the latter of which has been largely down to Simon Robinson. It’s a joy to report therefore that this new book which relates the genesis, birth and aftermath of Deep Purple’s seminal ‘In Rock’ album is a kind of massively expanded version of the thickest such CD booklet you could imagine – over 150 pages worth (and each page almost 4x the size of a CD). 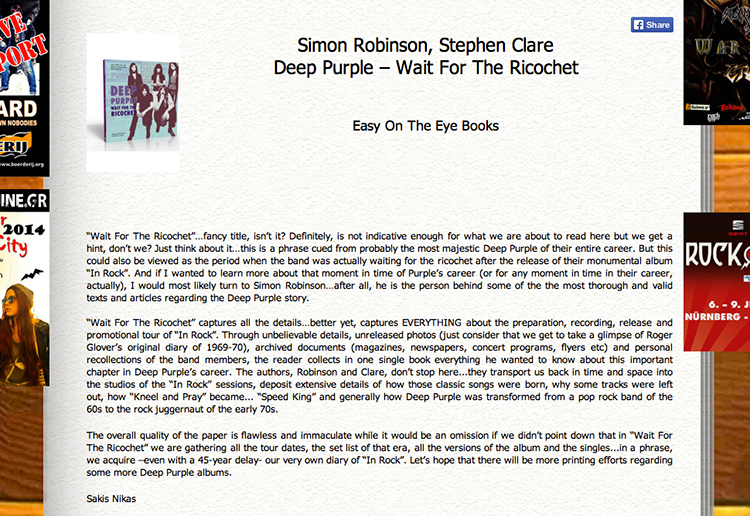 Aided and abetted by co-author Stephen Clare, Simon has gathered together quotes about the album from all the players down the years from both contemporary magazine articles etc, to more recent look backs and some interviews conducted specifically for this book – including one by Stephen Clare (which by the sound of it would make a fascinating interview CD in its own right) with Jon Lord, shortly before the musical icon’s passing. The work includes a track-by-track analysis of the embryonic beginnings of each ‘In Rock’ track – the information on how and where some of the material was road-tested and developed prior to recording makes for fascinating reading. There’s the expected wealth of photos (some familiar, many not) and memorabilia, press-cuttings etc. Indeed, you can pretty much have a look through this as a photo-book as well as a mine of Purple facts. Chart positions, alternate versions, outtakes are all detailed, along with a gig list, and whilst the timeline jumps about a bit, on balance this is preferable to talking about all aspects of each track in infinite detail before moving on. 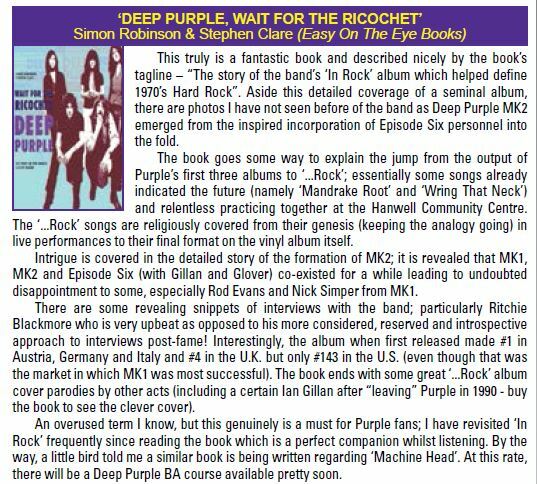 “DTB man Simon Robinson, alongside Stephen Clare have turned up trumps with a glorious book all about the creation of the Deep Purple album “In Rock”. Yes, you right that right. 160 pages all about one album. Even I now know more than I ever wanted to about Ritchie Blackmores amps. Thankfully, the story of the album is rounded out with the villainous buildup to the sacking of Simper and Evans (boo), and the nasty shenanigans surrounding the arrival of Glover and Gillan, setting the album in context with a look at the Concerto recording, as well as the touring, radio and TV appearances, and the piecemeal recording and writing. I had to read it from beginning to end, couldn’t lay it aside. t’s an astonishing labour of love, so much detail and very well written. Nice to see that this very important album gets the treatment it deserves. Thank you so much for this beautiful book. Adri Karsenberg.